Flying drones have become quite common nowadays. Not only have they become popular device that many gadget lovers would like to have, they have also become a kind of public nuisance to some. In the case of drones, most of the popular ones are the flying kind. While they can do a lot in giving users a bird’s eye view of everything, these drones are limited to that. But what about exploring under the water? That the job of the new BW-Space Underwater Drone. The BW-Space Underwater Drone is an underwater unmanned vehicle or UUV designed for personal use taking pictures or videos while exploring the environment under any body of water. Also considered as one of the most affordable of drones of its kind, the BW-Space features autonomous smart modes such as human imaging recognition, auto-adjusting LED lighting, and autonomous diver tracking technologies. This makes it fairly easy to control and pilot whether underwater or up above the surface. The BW-Space Underwater Drone also comes equipped with an underwater camera that is able to take 4K definition videos and ultra HD photos. A 128GB internal memory provides enough storage for those underwater 4K videos and HD photos. The drone has a 100-meter maximum diving depth and a maximum operating range of 500 meters. It can glide on the water at a speed of 2 meters per second. A 6,800 mAh battery provides power for up to 3 to 7 hours of operation. The BW-Space drone comes connected with a tether leading to the surface to provide direct control and communication at all times between the drone and its pilot. The water provides challenges when it comes to wireless control of the drone and the tether provides the simplest and more practical solution to an endearing problem. The tether also acts as the lifeline of last resort to pull the drone back up in case all else fails. 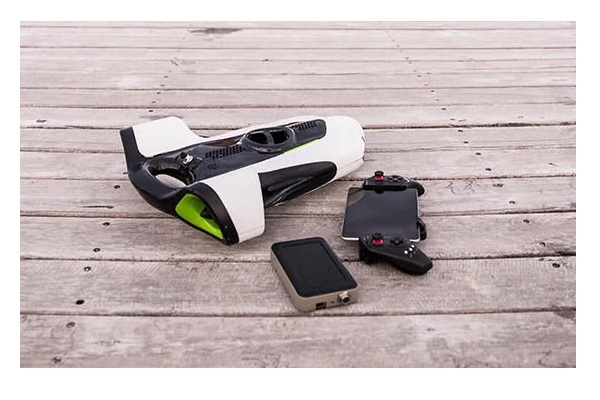 The BW-Space Underwater Drone is currently on a crowdfunding campaign on Kickstarter. You can get a basic version of the drone for around $659, with estimated availability sometime on October of this year.